ST. MARY-OF-THE-WOODS—The quaint country town of St. Mary-of-the-Woods, a few miles northwest of Terre Haute, seems a far cry from the “Wild West,” but when Mother Theodore Guérin arrived there in 1840, the Indiana forest was frontier country. Today, those very words are emblazoned on the walls of a shrine that now stands on the tamed landscape. The pioneer-religious sister accomplished what she thought impossible, successfully establishing a thriving congregation and a school in the midst of the wilderness. The Sisters of Providence of Saint Mary-of-the-Woods now boasts 298 members serving in 14 states, as well as Taiwan. This October, the community has reason for even greater joy. The sisters are celebrating the 10th anniversary of Mother Theodore’s canonization. Born Anne-Therese Guérin in 1798, St. Mother Theodore Guérin entered the Sisters of Providence of Ruille sur-Loir, France, at age 25. As pioneers poured into the American frontier, the bishop of Vincennes, Ind., requested that missionary nuns come teach the children in an ever-growing area. Mother Theodore, a renowned educator, reluctantly accepted the mission and, on Oct. 22, 1840, she and five companion sisters arrived at St. Mary-of-the-Woods. Surrounded by dense forest, the six sisters had to live in a farmhouse with a family of 10. Today, visitors to the site can walk inside a reconstructed log cabin chapel and experience the primitive conditions that met Mother Theodore: cramped quarters, crude furniture and inadequate roofing. Despite the many hardships, Mother Theodore founded an academy for girls and began educating students within nine months of her arrival. That academy evolved into Saint Mary-of-the-Woods College, a coeducational school recently ranked as a top Midwest regional college by U.S. News & World Report. 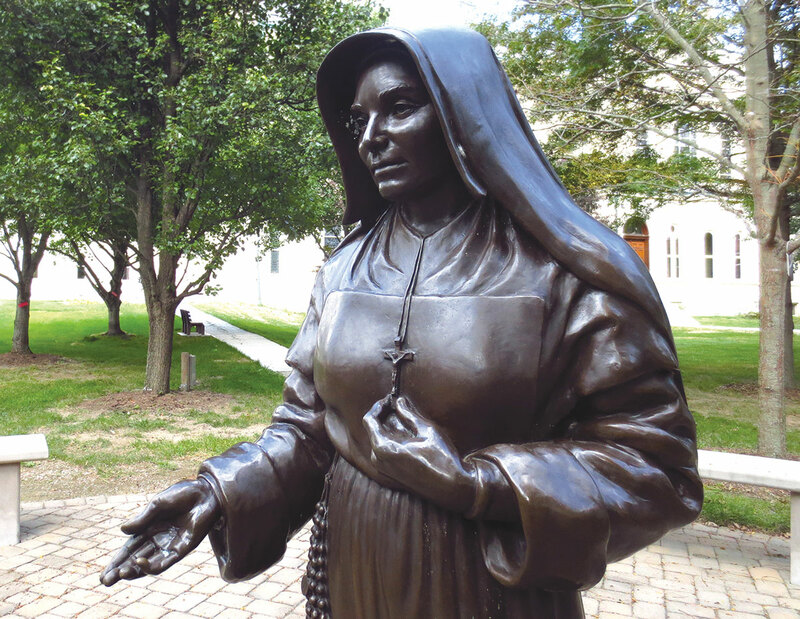 By the time of her death in 1856, the trailblazing religious sister had established 11 other schools in Illinois and Indiana, as well as two orphanages in the Hoosier state. Her cause for sainthood was opened in 1909. After her life, work and writings were examined in U.S. and French dioceses and at the Vatican, St. John Paul II declared her venerable in 1992. She was beatified in 1998, once the Vatican accepted as miraculous the 1908 healing of Providence Sister Mary Theodosia Mug through Mother Theodore’s intercession. A second miracle through her intercession, the healing of the right eye of Philip McCord, the facilities manager at Saint Mary-of-the-Woods at the time, was accepted by the Vatican in early 2006. Mother Theodore Guérin was canonized on Oct. 15, 2006, making her Indiana’s only saint. The congregation began celebrating the 10th anniversary with a special Mass on her Oct. 3 feast day. They planned to recall her arrival in Indiana with another service on Oct. 22. In the decade following her canonization, the sisters say devotion to Mother Theodore has grown. “We get requests from [people] throughout the world to receive a third-class relic or a prayer that they can say,” Sister Paula related. A third-class relic is an object that has been touched to a first-class or second-class relic of the saint; a first-class relic is part of the saint’s body, from bones to hair, and a second-class relic is an article that was used by the saint. The Sisters of Providence have meticulously preserved many artifacts from Mother Theodore’s life, and in 2014 opened a shrine to honor the pioneer saint. Once-commonplace items are now proudly displayed: her soup bowl, chair and desk, as well as her crucifix, pocket knife and gardening shoes. The shrine also houses a wooden coffin that contains the saint’s remains. “I meet people that say, ‘Whenever I have a difficult decision to make, this is where I come. I come to be with Mother Theodore to pray and to draw on her strength,’ ” said Sister Lisa. Indiana itself has taken steps to honor the sainted Hoosier. Former Gov. Mitch Daniels named a portion of U.S. Highway 150 “Saint Mother Theodore Guérin Memorial Highway.” The Indiana Historical Bureau installed a marker on the sisters’ grounds that outlines her significant contributions to the state. Mother Theodore also was granted the highest honor for Hoosier women, the Torchbearer Award bestowed by the Indiana Commission for Women. For the Sisters of Providence, Mother Theodore remains the quintessential role model.